Can you feel the new season? In the northern hemisphere, autumn is well and truly on its way. Even in Spain, I can see the leaves changing and our mornings have that fresh crispness to the air that tells me that cooler days are on their way. Autumn is a time of change and transformation. The beautiful colors of gold, red and green that we see in the trees are a lovely reminder of how beautiful change can be. 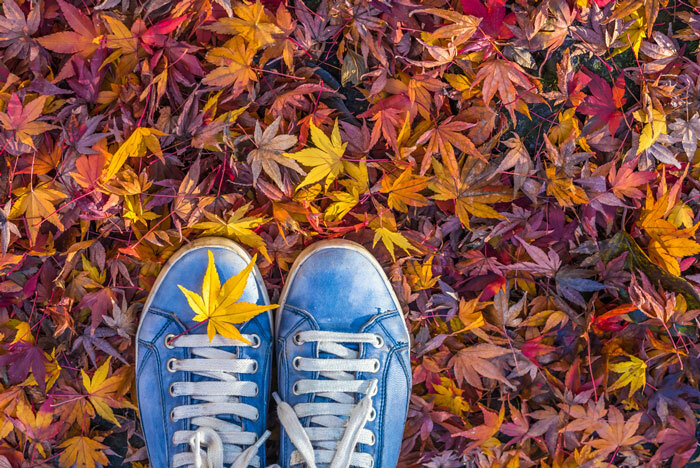 Just like hanami (cherry blossom viewing), there is also a ritual in Japan for admiring Autumn leaves. This is known as momijigari and is primarily an act of mindfulness that the nation has taken part in since the eighth century, encouraging reflection and quiet contemplation. 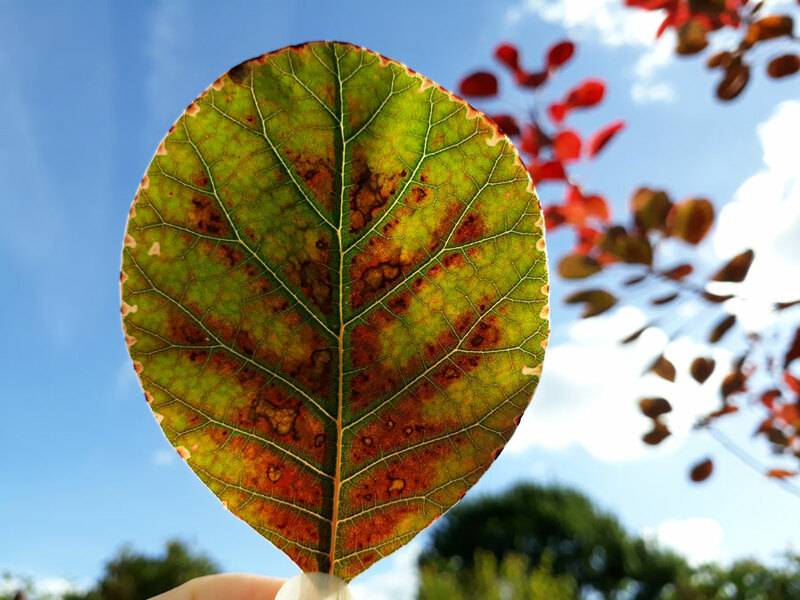 So today, I thought I would share some inspiration for observing the beauty in leaves to honor the season wherever you are in the world! I have added a few ideas and creative prompts below to inspire you. What do you love most about this new season? Wherever you are in the world? (I know many of you are in the Southern Hemisphere!) Feel free to leave me a comment below! Above: Remember to look down to see all the colors and shapes of leaves. 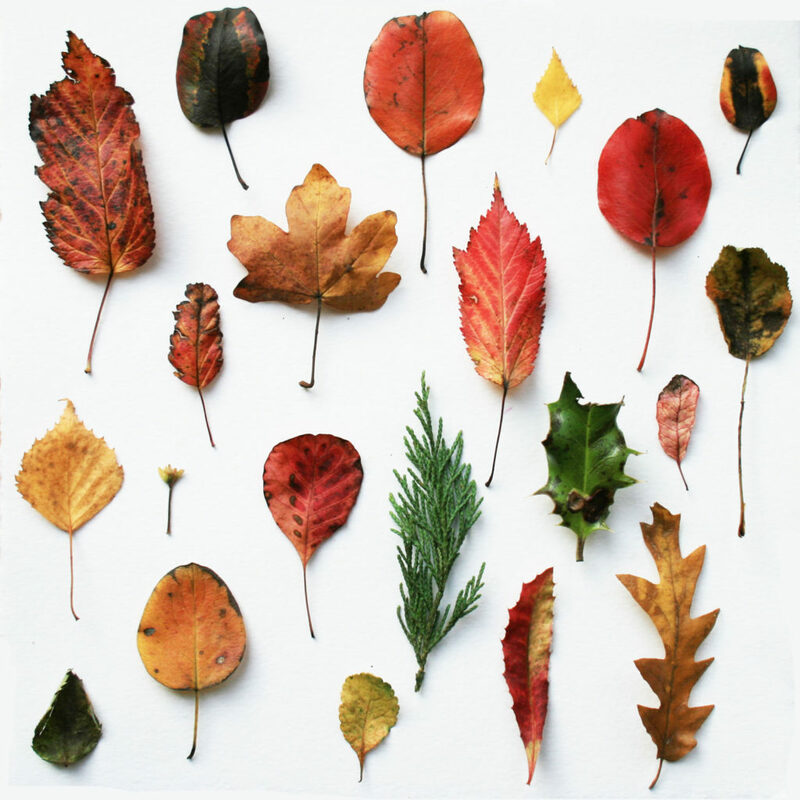 Walking, exploring and collecting leaves is a great way to honor the season, especially when you can spend time with others. When I visit friends in the UK, we love to walk out into the woods with the kiddies and collect bags full of inspiration. Whether it is a walk in the park or a stroll through the woods, take time to really breathe in and take mindful moments to reflect on the calmness of being surrounded in nature. Above: The beautiful pattern in a leaf fallen from a tree. Hold your leaves up to the sky, what can you see? Use the power of sunlight to find that connection to nature and the leaves you are collecting. One thing we can honor is the impermanence we find in nature and accepting the cycle of life in all things. Photograph moments that may catch your eye; an imperfect leaf, leaves soggy in the gutter, falling from the trees or a leaf in your hand. Practicing the art of mindfulness, seeing the beauty in all things will calm your mind alleviating stress and boost your immune system. 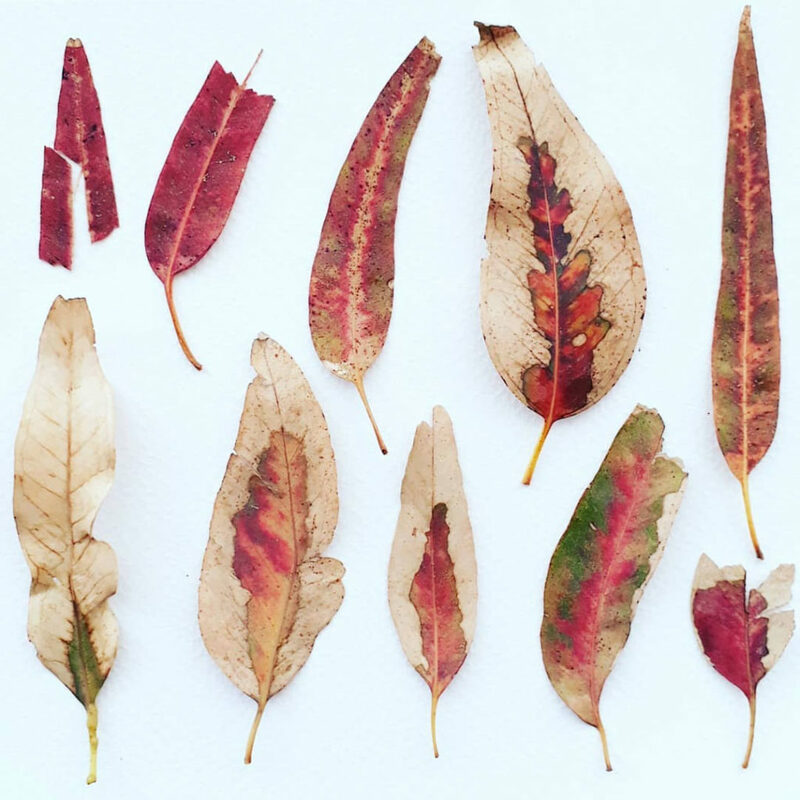 Record the beautiful leaves that you collect. They may not have looked too different when you picked them up, but look more closely and you will find unique beauty in each one. 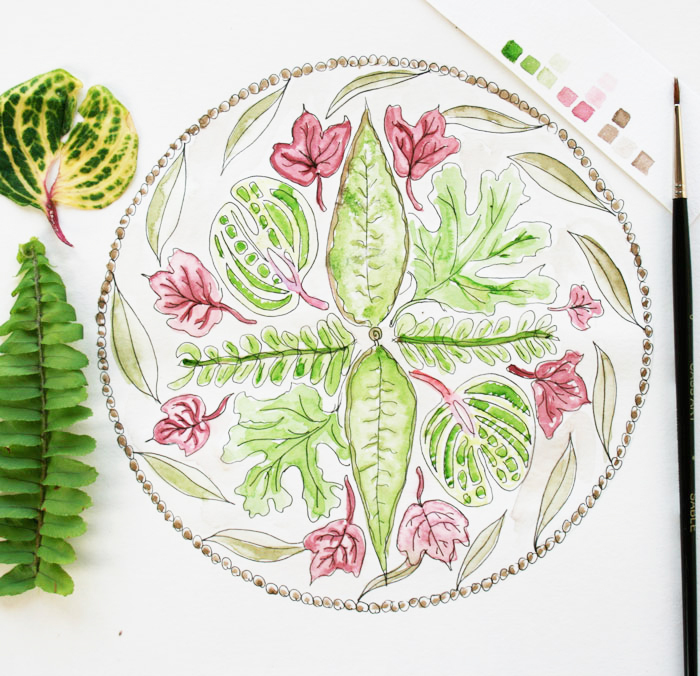 Position your leaves in a series of circular designs to see how many different nature mandalas you can create OR be inspired to draw your leaves or create you own hand-drawn mandala design. Join me for Inktober – daily drawing challenge! I am embarking on the month long Inktober daily drawing practice! 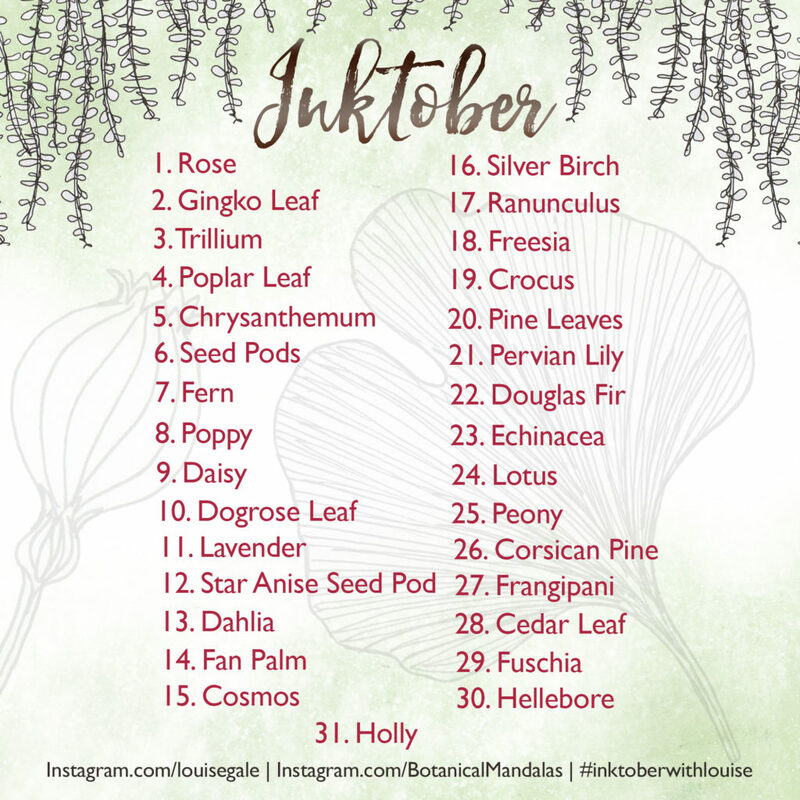 Every day for the month of October, I will draw and share 1-3 Botanical drawings on my Instagram account at @louisegale using my own prompts and then post an Inky Botanical Mandala on Instagram at @botanicalmandalas that I have created from the motifs! Would you like to join me?